Keeping your camera stable to avoid focus problems in low-light or low ISO situations is an ongoing challenge for a food stylist or food photographer. Some photographers avoid any type of stabilizing device because using one can somewhat infringe on the agility of movement. But others know that sometimes a little extra stability can really make the shot. For those of you who are of the latter ilk, you have your pick of three types of stabilizing devices generally used for food photography: tripods, GorillaPods, and monopods. You’re probably quite familiar with a traditional tripod, which is a three-legged stabilizing device that supports a camera, usually used in a low-light or long lens situation. 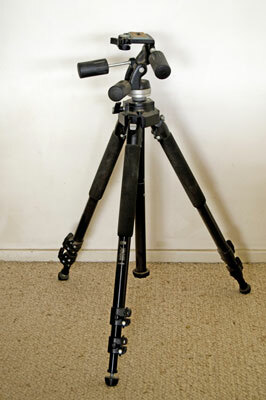 Tripods are generally made of aluminum or carbon fiber to keep them as lightweight as possible. Some food styling photographers don’t use a tripod when shooting food because they feel it restricts their movements when capturing the various tilts and angles of a food subject. When shooting foods, you need to be fairly agile and able to work quickly. But other folks love the stability, security, and image quality you can get from using a tripod. Stay far, far away from the flimsy $20 tripods found at low-price retailers. Sure, the price is amazingly cheap, but these types of tripods are simply not stable enough to use with a digital SLR. A good, quality tripod will run about $100 to $300. If you like the idea of a tripod but want a little more flexibility, a cool alternative choice is a Joby GorillaPod. These unique and unusually limber tripods can grip, wrap, bend, and twist to provide a secure and stable environment for your camera. A model that holds a digital SLR camera with a large lens runs about $50. 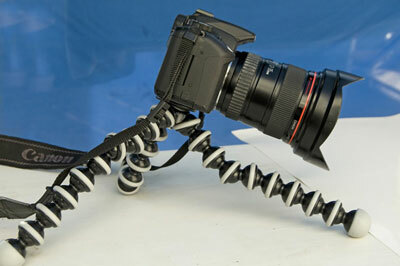 A flexible GorillaPod in action. A monopod is kind of like taking one leg of a tripod and attaching it to the bottom of your camera. This leg provides secure stabilization without the bulk and weight of a tripod. Several expandable sections in the monopod extend it to its full height, and rubber grips secure it in place. Overall, a monopod is less difficult to use than a tripod, and it provides more flexibility when shooting. 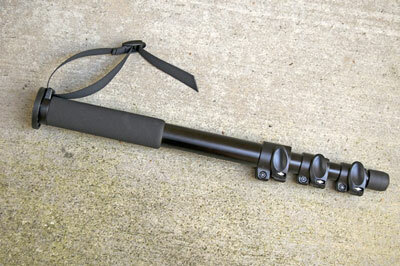 Monopods come in a range of sizes, weights, materials, and pricing choices. They start less than $20 and can go on up to a few hundred dollars. You can get a really nice, quality monopod for around $50 to $60. A monopod can help you capture some beautiful, clear images that would otherwise suffer from less-than-steady hands.